text by Tennessee Williams with images, printing, design, and binding by Amy Borezo. Red and grey are the prominent colors throughout the text. Red is representative of the main female character in the play, as well as death, blood, and sexuality. 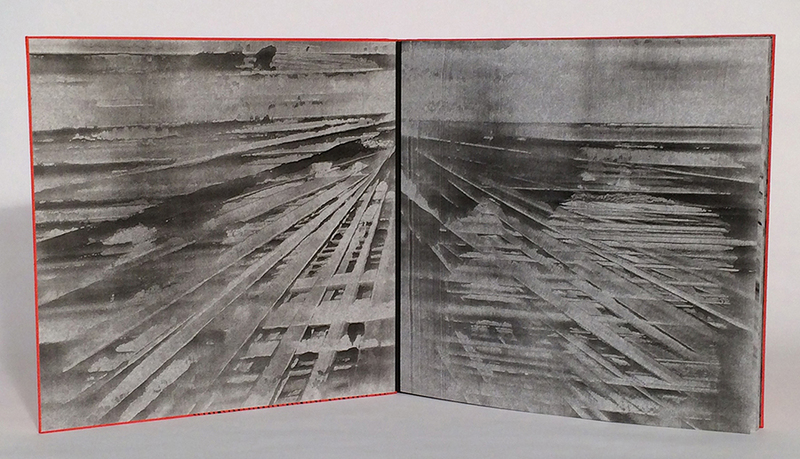 The black printed imagery on the cover evokes a levee, which is featured in the play. Diagonal forms are prominent in the text including stairs, roofs, and levees. First of nine image spreads. As the setting for the play is a Mississippi Delta farmhouse that is in danger of being flooded by a nearby river during a storm, my choice of imagery throughout evokes flooded landscapes and reflections on water. This spread in particular was influenced by research into archival images of the Great Mississippi Flood of 1927. Flooding often enhances the visibility of manmade grids on the landscape including roads, bridges, railroads, etc. All images are unique paste papers through the entire edition. Title page spread. The text signatures are sewn into the folds of the pages of a drum leaf binding. The imagery exists as an immersive horizontal space, similar to the setting of a theatrical stage set, while the action of the play is oriented on vertical pages in the center of the theatrical space. Here, the imagery evokes the movement of water. One of the final image and text spreads. Here the imagery evokes the explosion of the levee. Detail showing the red patterning printed on all text pages. This constant visual presence is representative of the constant murmur of the river at flood stage. 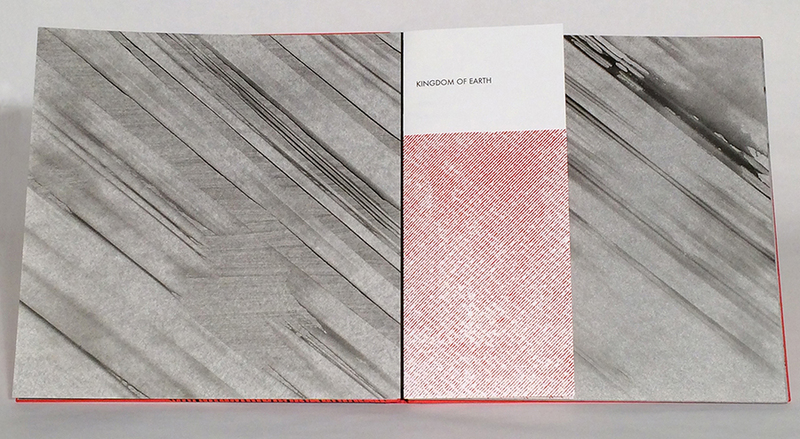 The printed red pattern gradually rises on the page as the book progresses, just as the water of the river rises. This visual rising corresponds to the climactic death of one of the main characters, and so the red ink begins also to read as blood. Letterpress/relief printing from photopolymer plates. Paste paper. Drum Leaf binding with sewn signatures. Tennessee Williams developed the concept of what he called a ‘plastic theater’ – a theater that is not simply a realistic rendering, but is open to the use of expressive devices in order to get closer to the truth of lived experience. 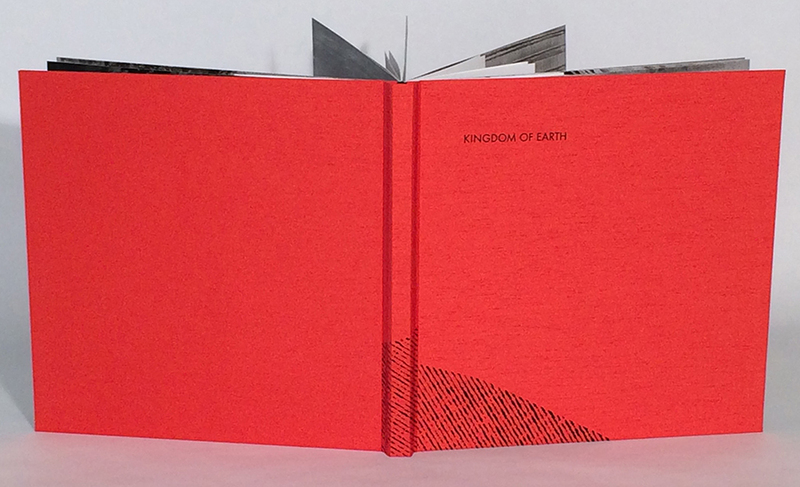 In creating a contemporary artist’s book edition of Kingdom of Earth, a one act play by Williams, I am using the book form to capture the playwright’s idea of a ‘plastic theater’. The setting for Kingdom of Earth is a character in itself and carries throughout the play a tension full of apocalyptic foreboding. A storm is flooding a nearby river. A property owner upriver is expected to dynamite his levee if the river continues to rise, which will flood the Mississippi Delta farmhouse in which the action is taking place. The sound of the river pervades the play with a constant rising murmur while the three main characters enact a dark dance around one another that touches on issues of race, sexuality, and survival. Though this play was written fifty years ago, the themes are applicable to our contemporary world with continued tensions surrounding race and sexuality, and the ever more frequent flooded landscapes caused by a changing climate. 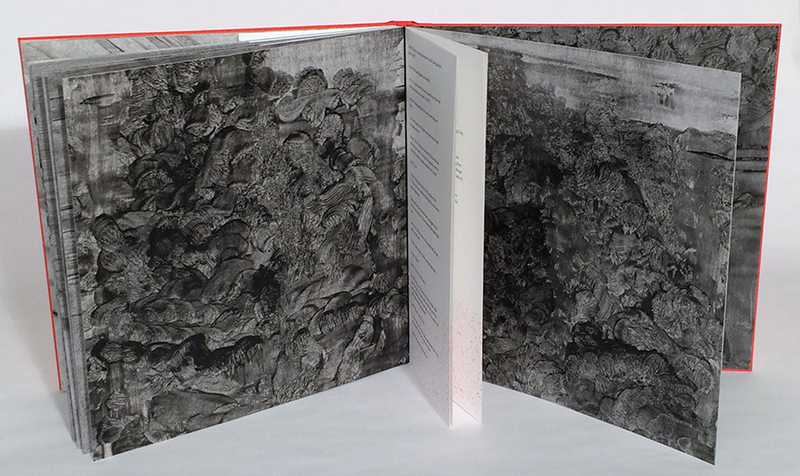 The size and structure of the book allows for an immersive experience, with abstract imagery evoking water, floods, and breached levees, surrounding and engulfing the viewer. The action of the play occurs in the center of page spreads, with imagery stretching out on either side. The imagery is created through the technique of paste paper making, a traditional handmade design process. The only colors mentioned in the play are grey and red. Red is used to symbolize the main female character, Myrtle, and female sexuality, but also blood and death. 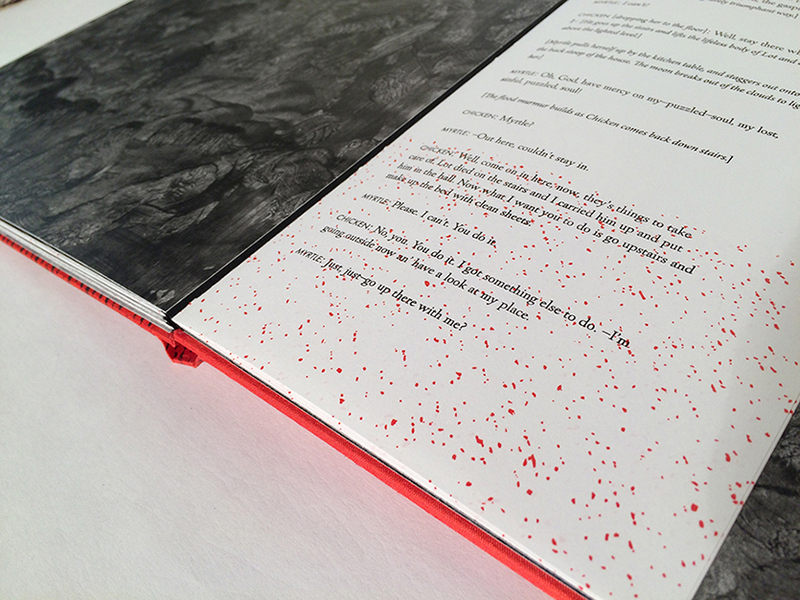 On each text page throughout the edition, the color red is used as a rising tide of graphic imagery that creeps up the page as the play progresses, just as the flood water rises through the course of the play. The text for Kingdom of Earth is from THE MAGIC TOWER and Other One-Acts, copyright ©1967 by the University of the South. Reprinted by permission of New Directions Publishing Corp. Images, design, and binding by Amy Borezo ©2017.